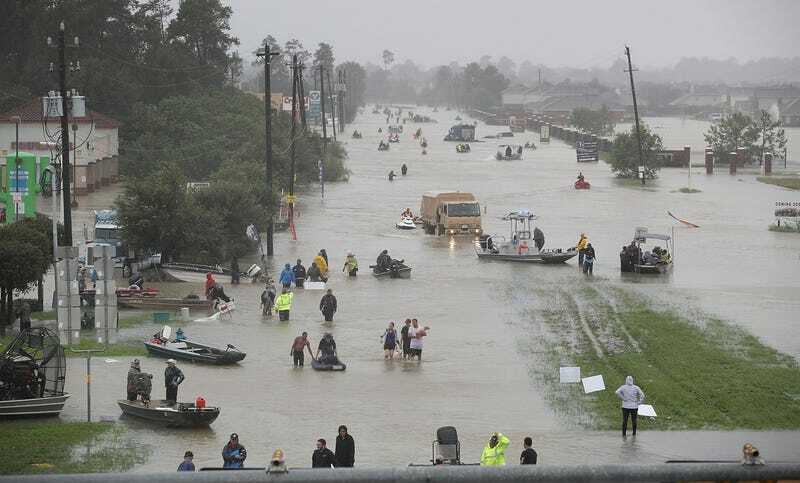 The devastation in Texas is horrific. People are just literally trying to keep their heads above water and many have been stranded for days without food. But one ABC News reporter took it upon himself to tell police about “looters” yesterday who were entering a supermarket. And he was appropriately dragged on social media for his idiocy. Tom Llamas has been reporting on the floods in the Houston area all week and has kept viewers up to speed via his Twitter account. But yesterday, he sent out a tweet which claimed that he had seen “looters” in the area, and that he had reported it to police. “We informed police of the looting and Coast Guard is flying overhead. Multiple officers now on the scene,” Llamas tweeted in earnest. The most generous reading of that tweet would be that some cannibal marauders were seen bashing their way into a nursing home to steal high-end electronics from elderly people. You’d definitely want to call the police if you saw that. But after Llamas started getting heat on social media, he deleted the tweet and sent out a clarification that made clear he didn’t spot any roving bands of marauders terrorizing helpless citizens. Yes, you read that right. In the middle of discovering a dead body from the flooding, Tom Llamas saw people entering a supermarket and he told the police. Great work, Tom. His own TV network has been reporting on the people who’ve been struggling during the past few days without food and clean water. But for some reason Llamas felt it necessary to waste the time of police and the US Coast Guard in this disaster zone by snitching on people entering a supermarket. It’s difficult to comprehend this level of stupidity. People on Twitter have been tearing Llamas to shreds. But he still doesn’t seem to understand that in the middle of a disaster, obtaining food and clean water can be the difference between life and death. And that getting in the way of people who are trying to scavenge food is simply perpetuating suffering. Many people pointed out that during Hurricane Katrina, there was a remarkable racial bias shown by the media as to who was a “looter” and who was merely “finding food.” Llamas never mentioned race but Gizmodo has reached out to the Houston Police Department for more information on this incident. Some people on social media have even called for Tom Llamas to be fired, pointing out that scavenging food during a disaster would not be considered a crime in any normal, compassionate society. In disaster movies, the audience is meant to root for the people who are looking for food amongst the devastation. But people like Llamas probably look at those scenes and think “damn looters.” Why can’t they pay for food like normal people in the middle of a life-threatening emergency? If Llamas wants to report on any other crime-doers in Texas, we found a few more among the photos that are emerging from Houston. You’re welcome. This member of the Texas Army National Guard has been going house-to-house to look for survivors, marking houses that have been cleared. But I’m sure Llamas probably sees a vandal. Won’t somebody think of the innocent paint jobs? And here’s a group of people crossing the flooded street without looking at the crosswalk signal. Lock them up. And here are some people walking right in the middle of the road. Surely there’s a law against that. Go get them, Tom! Here are people being evacuated in the back of a truck, but you’ll notice not a single one of them is wearing a seatbelt. Does the depravity during Hurricane Harvey know no bounds? And a car that was just left abandoned in the middle of the highway. They should get a ticket for that. And here’s a family using a kiddie pool as a lifesaving boat for their kids. How do we know that’s their plastic pool and not one that they just found drifting along in the floodwaters? Do they have a receipt? ABC News should investigate as long as they’re snitching on people who are looking for food. Look at these people. It doesn’t look like they’re breaking any laws, but I’m sure Tom Llamas can come up with one if he thinks hard enough. Keep up the great work, Tom. Let us know if you see any other vicious crimes against American-style capitalism being committed in the wake of the destruction from Hurricane Harvey. You’re the real hero here.